Help set the pool up for workouts. Put in the lane ropes, get out the kickboards, pull buoys, etc. If you are late, warm up on deck and start the workout at the same point as the rest of the swimmers in your lane. Within a lane, swimmers should arrange themselves for each set with the fastest swimmer in the front and the slowest at the back It is the lead swimmer’s duty to ensure that the lane starts swimming at the proper time for each swim in a set. Allow 5 to 10 seconds or 5 meters between yourself and the swimmer ahead of you when swimming repeats. If you need to pass another swimmer, speed up and overtake the swimmer on the outside just before the wall, or touch the toes of the swimmer (once!) as a signal that you wish to pass. 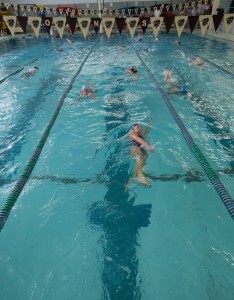 The swimmer in front should stop at the end of the length and allow you to pass. As you approach the wall for a turn, cautiously ease over so that you can push off in a straight line. Try to swim the workout as posted, but sit out a repeat or two if you need to. Don’t initiate your own workout unless you have agreement from the coach or others in the lane. If you are not doing the same thing as the rest of your lane, do not interfere with what they are doing. Either swim at the front or back, or consider somewhere else depending on the circumstances. When resting at the end of the pool, move to the side of the lane so that others may turn freely without fear of injuring you.